I have been quiet for the last fortnight, or so. While I have been working on future podcast episodes and other KB work (and dealing with a rather lengthy and annoying dose of sciatica), I’ve been largely avoiding social media. I’ve found it really difficult to put into words my feelings about the EU Ref and the current political, and cultural landscapes. I have found the last couple of weeks utterly bewildering and reading my timeline on Twitter (when i do venture there) I have seen people sharing their experiences of their own bewilderment and frustration, as well as experiences of hate and discrimination. When I read things like this I feel a mish-mash of sorrow, hurt, anger and head-shaking mind-bogglification. Some of my friends have managed to write coherently about how these current times have and are impacting on them. Perhaps I will be able to do the same soon. I hope so. Until then I am going to focus on the only things which are managing to give me a little grounding, if not a distraction at the very least. If you fancy reading on, these are the things which have helped in the past two weeks. Despite having a horribly sore back, we manged a couple of hours at Woolfest at the end of June. It was like a woolly womb on the day of the EU Ref result. I wanted to take the dog home! I bought some wonderful Castlemilk Moorit and Cheviot and Black Welsh Mountain and Cheviot blends from Dodgson Wood (and I will be looking for more…delightful stuff!) I also bought a fleece! More on this another day! Taking a break from putting out podcasts in June was very productive! At the same time there are still to-do list items that I need to get on with! I have always enjoyed the whole podcasting process and have really cemented my love of this. The next episode is out on Friday. Here is a sneaky peek. I’ve had the pleasure of experiencing some grounding in-round-through-off meditative knitting with some beautiful yarns. Some of them are going to be reviewed soon here, so I won’t say too much! 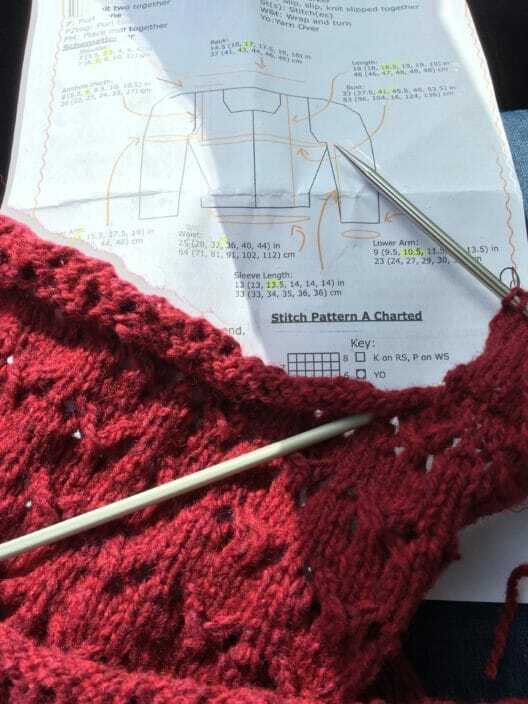 I’ve been haring along with my hetty cardigan, by Andi Satterlund. 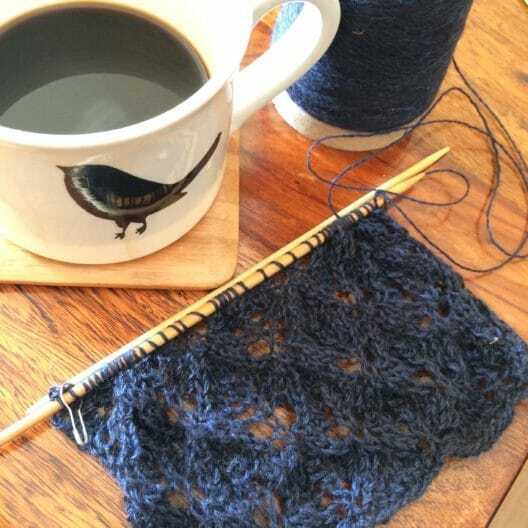 This was meant to be a quick cast on project whilst I waited for my new needles to come for my Hamegaet hap, in the #Bookofhapsalong, however it is a bit of an addictive and quick knit! I also love the Jamieson’s of Shetland heather aran too! Sylvan Tiger Gradient Shetland packs…all i will say is OH.MY.GOSH! and today some gorgeous British breed (and blend) samples from Barber Black Sheep arrived on my desk… how creamy and lustry! Although I am not taking part in the Tour De Fleece, I have been doing a bit of spinning lately too! 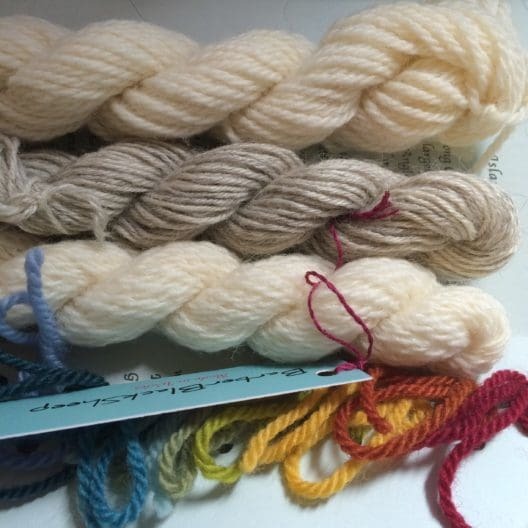 I am really enjoying exploring fibres and different breeds. Spinning is a real mediation at times. We all need a little distraction of the simple and even little trivialities to cling to at the moment, what is yours? How are you doing? information: Film copyright to Big Tall Wish. Images copyright to KnitBritish all rights reserved. Please do not use images without express permission. Of course there is a lot of uncertainty out there at the moment as a result of the Exit vote but I know for a fact that there are lots of people, much brighter and more clever than me, who are paid to sort all this out! I am not talking about politicians but the much maligned civil servants who are hugely experienced and who know exactly what they are doing. I am so impressed by the level of intelligence that some people are blessed with; judges, doctors, generals and the like, not every single one of them but the vast majority. The same applies to a lot of entrepreneurs, business men, electricians, plumbers, designers and more. The Exit vote hasn’t changed any of that and once the dust settles they, WE, will sort it all out and make it work. I have faith, I am positive the EU will also try to make it work. Forget some of the rhetoric politicians spout out and think about the underlying infrastructure that exists to keep the wheels turning. I found myself weeping over the whole thing. Why? I don’t really know! But we are not alone in having been affected on a visceral level. We have to focus on the lovely things and trust others to get on with the business of making things OK. It will sort itself out because it always does, but in the meantime we just have to batten down the hatches and KBO! I feel your pain, as many Americans do. But consider this: at least you don’t have Donald Trump in the running to be your chief executive. Louise, you expressed in your post exactly how I have been feeling since I woke that Friday to the result. Tears were shed I can tell you. Please don’t be sad or worried, fear is a terrible master. I look at it as an adventure, something new and exciting like a teenager leaving home for the big wide world and teenagers of all colours and creeds do so everyday,all around the world. I have 4 teenagers that I have watched leave to make their own lives amazing. Thank you for sharing your thoughts and feelings. I am glad you are finding comfort in fibers and fiber related arts. We are fortunate to have it in our lives. It is a difficult time for all of us these days, here in the US and the UK. And how do we change what is going on? My first thought was to share and teach as much as we can about the grounding arts such as quilting, spinning, knitting, sewing, farming, etc. to ground our youth and adults – to keep anger from taking over. Perhaps this is too simplistic, but healing and the cure has to start somewhere. I guess I am speaking mostly about the terrible violence that is going on in our country now. What’s the saying: “Idle hands are the devil’s workshop”. Love this gentle post. Yes, I was shocked at the result, iv always thought myself a European, but I guess I shall have to rethink now. Taken my mind off this by moving house, just packed a big box and wrote “knitting stuff” on it, when the needles come out I shall be facing the Atlantic rather than the North Sea. Planning my next yoke fair isle, I kept my Smith & Jamison shade card out of the box, it’s full of promise. I can not recommend this book and this type of treatment for your back enough! Not sure if you can find a PT that uses the McKenzie method but it saved my life!